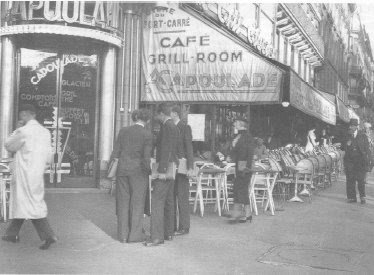 Writing in a Paris cafe, an art form and way of life perfected by many writers and philosophers of 20th century, appear to be fitting less well into the modern times. 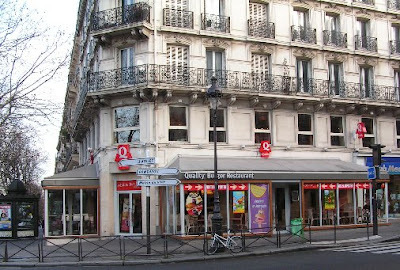 Still, there are some places in Paris where a customer with a laptop is welcome. I bet, if you come with an antique typewriter, you will be greeted even warmer. On this my trip to Paris, I made a little discovery: one can dring only finitely many café au lait‘s. But gunpowder tea is a real solution for a long working session, it can be consumed in unlimited quantities. Also, it provides excellent value for money: you order a pot and then ask the waiter to top it up with hot water. High quality green tea can be topped up up to 6 times without obvious loss in quality. France has a wonderful tea tradition; teas from Damman are widely available in cafes and bistros, and their gunpowder tea is excellent. To add insult to injury, the opposite corner site is held by MacDonald’s. Nowadays, would it be possible to do mathematics in burger joint? Therefore, support Slow Food Movement! Can you imagine a British shop with the word “mathematical” on the shop sign? 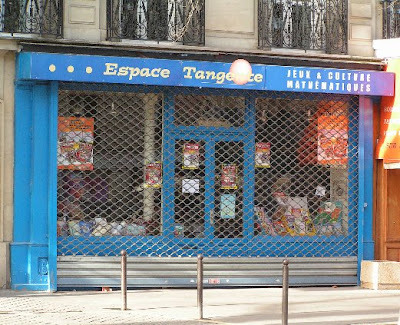 (Espace Tangente, 80 bd St Michel 75006 Paris; closed on Sunday — this explains a unfortunate wire mesh.) Yesterday I bought there a nice book on mathematics in music. See a website of the publishing house Editions Pole, it apparently owns the shop (or vice versa). Since I mentioned British Library in a comment to my post “Nabokov and Onegin’s Stanza“, I wish to add a brief tip on a hidden tourist gem of London: British Library on Euston Road, between Euston and King’s Cross/St Pancras train stations. If you find yourself dying of boredom at Euston or King’s Cross with 40 minutes to spare, visit the ground floor exhibition of the British Library – it is 5 minutes walk, entry is free (and instant, the exhibition is in the entrance lobby). You will discover fantastic treasures, like the logbook of HMS Victory with the record of Admiral Nelson’s death, or the manuscript (actually, exceptionally tidy handwritten book – true labour of love) of Alice in the Wonderland.